Emerald with its vibrant green hues is the birthstone of May and is closer to nature than any other gemstone. TJC designs genuine emerald earrings with utmost care and precision to bring to you the most alluring pieces of jewellery set in gold, silver and platinum. From simple to stunning, from basic to chic, from formal-wear to designer-couture, TJC has an assortment of earrings to suit all tastes and budgets. An emerald being one of the four most precious gemstones is not only indispensable for your collection but can also be counted-on for accentuating your personality. Gemstone earrings are a sophisticated choice for adding the final touch to your ensemble and Emerald stud earrings are fast becoming one of the most desired jewellery items in the UK. Don them every day at work or put them on for a night out with your best friends, these stud earrings are perfect for every occasion. TJC offers an inexpensive range of earrings that blend in seamlessly with your wardrobe while making sure you have a rich assortment to choose from every day, when you step out to conquer the world. Emerald is the harbinger of new spring growth, symbolizing new beginnings and change; it is also an evergreen gemstone capturing the heart of the people for centuries. If you have been falling short of ways to thank your mother or sister for having your back all these years, then the appealing emerald drop earrings from TJC are what you need. Choose from the chic, enticing and eclectic collection of TJC’s online boutique, a pair of drop earrings as the perfect gift for the special ladies in your life. Emerald is not just a stone; it is a phenomenon so pure and rare that it is even more expensive than a diamond at times. And when coupled with the latter, the end result is nothing less than extraordinary. TJC’s Diamond and Emerald Earrings online are intricately designed and skilfully crafted to become your most prized possession. For the ladies who are born in May or ready to celebrate their twentieth or thirty-fifth wedding anniversaries – you now know what to ask for on the special day. Cherry-pick from the style you love the most – halo, drop, hoops, dangle, and cluster today! Life is like the season of spring and all you need are some flowers, love and Emeralds to be happy, TJC strives to make sure you are. The exotic richness of emerald looks ravishing when it is paired with the radiance of gold. 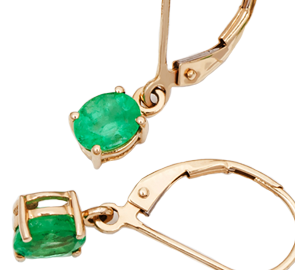 Our gorgeous pieces of gold emerald earrings have been the coveting of countless. Not only with the traditional excellence of earrings in yellow gold, but our spanning collection also offers you the elite elegance of white gold and darling femininity of rose gold. If you’re looking for a premium touch at pocket-friendly prices, then don’t miss out on our carefully put-together selection of emerald earrings in silver. These beauties offer you an eternal shine that will remain the same for years to come, along with hard-wearing durability. And if you want a posh touch, we also offer you plating of gold, platinum, rhodium, and other premium metals over silver base construct. TJC’s shop for online real emerald earrings in UK is known for its rich diversity. We offer you a stunning vastness in range that you won’t have seen anywhere else. Our marvellous designs bring you the absolute bests of all styles and fashions. However, what makes us extraordinary is our pricing. We offer you a range of affordable emerald earrings in UK that will bring an uncompromised quality at prices that your pockets will love.